Do You Need Workers’ Compensation for Your Small Farm? The succession of plant communities is a process that has drawn attention from woodlot owners, ecologists and foresters for decades. Succession deals with communities or groupings of various plant species in the same vicinity. Succession was one of the earliest ecological processes studied. The simple definition is the predictably and orderly progression of change in the plant species that dominate an area. The classic image is of grassy fields, followed by brush, then small trees, and finally forest. The details though are more involved and more interesting. The cycle of succession starts with the response of a plant community to a disturbance of previously vegetated lands. Because plants occupied the site before the disturbance, this type of succession is known as secondary succession. Succession on land that did not previously have plants, such as soil exposed as a glacier retreats or a new sand bar in a river is called primary succession. Forest succession is simply the succession or the orderly and predictable change in the dominant species of forest plants. The change in dominance occurs because the plants that dominate early often die early, allowing longer lived plants dominance. In the Northeast, most lands have gone through, and continue with, succession since agricultural lands were abandoned. Most agricultural abandonment happened between 1880 and 1950s, and our forests are thus 70 to 120 years old. In additional to agriculture, the forest might have been extensively cut-over, or disturbed by hurricanes or fire, and plants regrew. All owners are observing forest succession on their property as the forest changes through time. 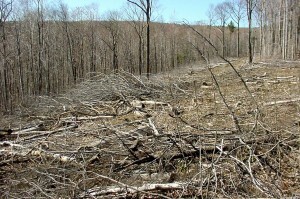 A clearcut is an example of a stand replacing disturbance that resets the successional process to the beginning. Many different tree and other plants species will occupy the site, but the early successional dominants, such as pin cherry, birch and aspen will form the early canopy. Forest ecologists recognize four phases of forest succession, or what is sometimes called forest development. These phases are: (i) stand initiation, (ii) stem exclusion, (iii) understory reinitiation, and (iv) steady state. Each phase has specific characteristics that are typical regardless of the type of forest that is succeeding. The timing of each phase is variable and difficult to anticipate. Each phase also has a variety of management practices that, depending on ownership objective, are relevant and timely. In all phases, assistance from a forester will help focus effort on those activities most likely to support ownership objectives. Stand Initiation – The stand, or plant community of a location, initiates following the cessation of the disturbance. Stand initiating disturbances are sufficiently intense and wide spread that large amounts of sunlight are available at or near the soil of the forest floor. The increase of sunlight provides the essential and often limiting resource to allow new plants to establish or existing plants to begin growing and dominate. During this phase, most plants that will occur in the developing forest will establish. Although different plant species will become more dominant or apparent through time, they all become established during the first phase. The duration of this phase is shortest, perhaps 15 to 25 years when there is abundant seed and soil resources are plentiful to the plants. 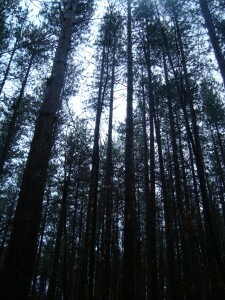 The stem exclusion stage is illustrated in this 70 year old red pine plantation. Note the tight crowding of crowns and the absence of an understory. Some of the pines are starting to die (some from Sirex wood wasp) allowing sunlight and eventually an understory to develop. In some stands, partial harvests of long-stagnant stems might trigger windthrow especially if soils are shallow. particular interest but occurring in low numbers, the potential for deer browsing might encourage the owner to invest in some tree tubes and black locust stakes for use in preventing browse damage. Stem exclusion – Within the stand or plant community, as plants continue to establish and grow, a point is reached where sunlight and soil resources become limiting and additional plants are excluded. As the existing plant then continue to grow, their competition for sunlight results in some plants gaining an advantage over plants adjacent to them, resulting in winners that live and losers that die. Often the trees with the competitive advantage have forked stems and thus bigger crowns that occupy more space. The duration of this phase depends on the mixture of species and their growth rate. For fast growing and shade intolerant species, the phase may last 20 to 30 years. This phase would be protracted with shade tolerant species and poor soil conditions. Management during stem exclusion is an economically tenuous activity. However, other if not many owners don’t anticipate their financial returns over the decades, and view work in the woods as a pleasure and a pastime. The financial concern is that any work is an investment and that investment would be carried forward until there is a revenue event. In our woodlands, that revenue event may be many decades. If work is conducted, it might focus on helping stems with good structural integrity, those stems with strong wood and without weak joints, maintain their crown in the upper canopy and access full sunlight. Stems with forks may be stressed, the fork forms a ridge of “callus” tissue ( a tree’s version of a scab). The bigger the callus ridge, the more stressed is the fork and the more likely the fork to fail. Crop tree management is a strategy to make sure that the trees selected by the owner as priority trees for long life and productivity are without competition on at least two if not all four sides. Understory reinitiation – During the stem exclusion phase, the depth of the canopy elongates as fast growing trees get taller and those more tolerant of shade or in the process of dying grow more slowly. Some trees are now approaching sexual maturity and starting to produce seed. As the depth of the canopy elongates, as seeds are produced, and as some trees die, the potential for a new understory to initiate begins. The duration of this phase depends in large part on the longevity of the dominant species. If long-lived species were early dominants, their natural life span will slow the rate of their death and thus extend the duration of this phase. For example, early dominants by poplar might have a life span of 60 to 80 years, whereas if white pine and red oak, or sugar maple, are the early dominants then the life span might be well over 100 years. Multiple stemmed trees often dominate early in succession because they have large crowns. However, the forks may be weak as illustrated by the callus ridge (right and left side) that bracket the main stems (top and bottom). The ridge forms as the forks is strained by wind and snow, and the straining is damage that allows decay organisms to enter. These types of stems can be removed during crop tree release to favor stems with structural integrity. Management within the understory reinitiation phase is potentially productive, and in some cases may have a minimal positive revenue. Trees are of a sufficient size that the labor to harvest the poor quality stems might be offset by the value of the stem for firewood or for other low value products. Be cautious to avoid the temptation to harvest the fast growing high value trees using a selective or diameter limit strategy. This removes the majority of value, degrades the forest, and redirects the successional pathway. Many of the early successional dominants, such as the poplars and paper birch are approaching their natural life span. If markets or desired products can be obtained from these species, harvesting now will allow owners to utilize the wood before the stems die. Further, other species have demonstrated what they will have as a form, and owners wishing to select for particular forms of stems can continue to practice crop tree management. This is also a time when invasive plant species or native interfering plants can establish and begin to form a pervasive understory. 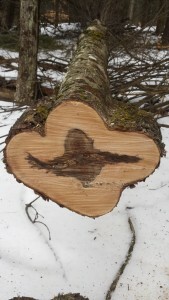 Many tree harvesting activities will further open the canopy which infuses sunlight and disturb the soil surface. Sunlight and disturbed soil promote the establishment of most plants, and thus owners need to have a heightened sense of awareness to interfering plants. Steady state – The final phase is the mature forest. Early successional dominants have died. The majority of the upper canopy are those species able to reproduce with limited amounts of light or that depend on a large disturbance for re-establishment of the dominant species. In the absence of external disturbances the forest reproduces itself among those species that can survive in sunlight available through small openings in the canopy as single trees die. The absence of external disturbances is infrequent, and thus the forest that is maintained is more heterogenous and reflects trees species that grow in small to mid- to large-sized canopy gaps. Human and natural events create canopy openings of various sizes and these favor tree species with different requirements of sunlight. Management during the steady state will depend on the previous management and how the forest has developed. Trees are larger and have greater value, and the participation of your forester is especially important to protect your investment. Previous management may have created a forest where the owner can have sustainable partial harvests, thinnings, that allow additional growth on the best trees without reducing stand production or potential. Now, as before, careful attention is warranted to the presence of interfering plants and to avoid high-grading. Some owners will decide to restart the successional process with a regeneration harvest. This harvest should be guided by a forester, with a carefully selected logger, and with attention to the potential pitfalls of deer, interfering vegetation, and avoiding exploitive harvests. More information on these pitfalls is available on the NYFOA website through the Restore New York Woodlands (RNYW) Initiative. In some cases succession can be arrested and the plant community stalled in its orderly and predictable progression. Succession stalls when something prevents trees from establishing and dominating a site. In some cases arrested succession is desirable, for example your lawn or hay field that you mow regularly during the summer, or the power line rights-of-way where shrubs are encouraged to dominate and trees are removed. Often, however, on rights-of-way, the dominant shrubs are invasive and create corridors where they can spread across the landscape. In other cases, over abundant deer or interfering plants can prevent the establishment and development of the forest. Support for ForestConnect is provided by USDA NIFA and the Cornell University College of Agriculture and Life Sciences. Peter Smallidge, Ph.D., is the NYS Extension Forester and Director, and works with the Arnot Teaching and Research Forest, Department of Natural Resources, Cornell University Cooperative Extension, Ithaca, NY 14853.